Marilyn and Mike McMillan recently contacted me about images of two photographs - a cabinet card and a cdv - included in my profile of this photographer. My husband and I were looking at this site and noticed that we can identify the people in two of your unidentified photographs ... 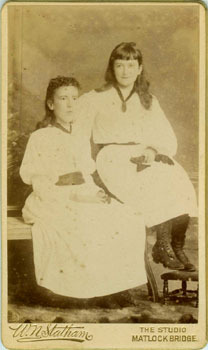 The first photograph is of two unidentifed young girls seated in white dresses. The second photo underneath is of an unidentified middle aged couple. 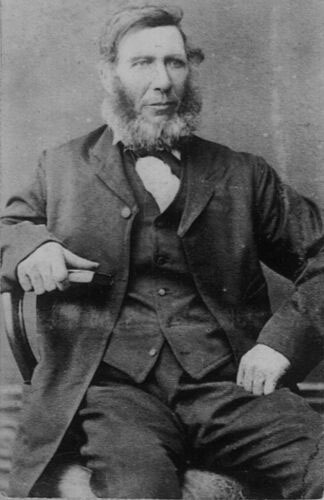 He is seated with his arm resting on a table and he has a large beard. His wife is standing. This middle aged couple are my great grandparents. An enlargement of this photo hangs in my home. 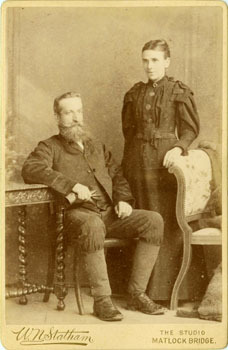 They are Henry Statham and his wife Ann Jane (Wass) Statham, both born in 1853. Henry and William Nathan Statham were first cousins. Henry Statham's father, Isaac Statham (m. Sarah Carline), and William N. Statham's father, Abanathan, were brothers. The two young girls in the previous photo are Henry and Ann Jane Statham's daughters - Gertrude (on the left, born April 4, 1882) and Lilian (on the right, born Feb 16, 1886). This family along with two sons, Henry (my grandfather) and Isaac emigrated to Ontario, Canada in 1903. I am the only child of Walter Statham who was the only child of Henry Statham, the son of the Henry in the picture. So I basically have everything worth saving that belonged to my grandparents. The oval enlargement, and also an oval enlargement of my father's maternal grandparents, Walter and Sarah Barrett, were in a large envelope unframed. These pictures must have come to Canada in the early 1900's. My husband and I had them framed a few years ago so they must have sat in the envelope unframed for most of the 20th century. They were in very good condition. This is really interesting. Putting pictures on a website like yours proves that it is possible to identify people in photos. Marilyn kindly sent me some photographs of Henry and Ann Jane Statham later in life, after they had settled in Canada, including these two. She also provided two images of cartes de visite by the Derby branch of A. & G. Taylor's countrywide chain of studios, showing Gertrude and Lilian Statham, which must have been taken shortly before their departure for Canada in 1903. I've never come across such a life-size portrait, and wonder how common they were - presumably not very. Have readers information about any such life-size enlargements which have survived? I'd be interested to hear from you. 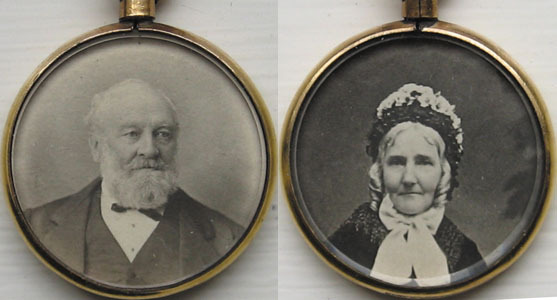 Frances Castle also sent me these photographs of two sides of another locket from her family collection, which demonstrate that lockets were still popular well after the demise of the daguerreotype. The Derby Local Studies Library sent her an image of a mounted albumen print in their collection, taken in 1872 by W.W. Winter, clearly signed by William Bakewell Sherwin (1811-1898), chemist, druggist and town councillor. This enabled Frances to identify the male subject of the locket, and confirm that the woman on the other side was indeed, as she had suspected, Sherwin's second wife Susanna Columbell. 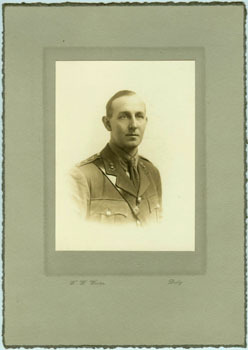 William B. Sherwin's grandson, Charles Bakewell Sherwin (1877-1950), was a photographer with premises at 10 St James' Street, Derby in the 1920s. 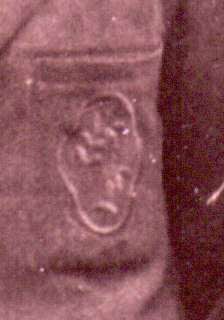 Frances Castle sent me this photograph of a locket which has been passed down through the family generations, and which she is pretty sure must have been taken in Derby. However, she can't decide whether the subject is Sarah Collumbell née Hughes (1781-1863) or Esther Sherwin née Bakewell (1776-1843). If it is a daguerreotype - and I can't be sure about it as I'm not very knowledgeable about this type of image - then it is likely to have been taken in the 1840s or early 1850s. After this time, first the ambrotype and then in the 1860s, the tintype and carte de visite, superseded it in popularity. However, the clothes of the elderly woman seem to me to date from the 1850s, and I think it more likely that it was taken after 1843, the death date of Esther Sherwin. 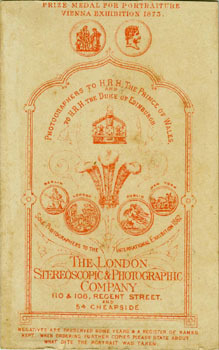 Photography was still very much in its infancy in the early 1840s, and daguerreotypes were not at all common. John Johnson, the first photographer to work in Derby, operated briefly from premises in Victoria Street in the summer of 1843, so it is conceivable that he took this photo. However, it is far more likely to be Sarah Collumbell, who would have been 65-75 years old in the late 1840s or early 1850s. 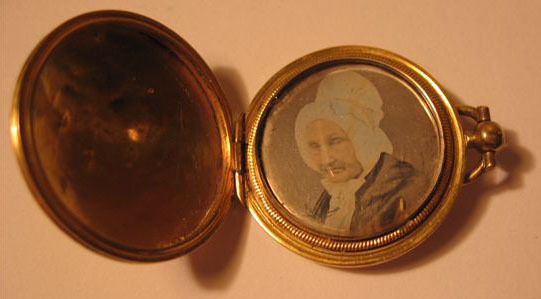 I'd be keen to hear from anyone more knowledgeable about daguerreotypes who might be able to enlighten us on the nature of this locket (Email me). I recently received an email from a reader in Australia with an interesting enquiry. She sent me images of two different photographs. The first of these had been clearly identified as being a known family member and immigrant who arrived in Australia in early 1842, aged about 23 years old, the photo being taken some time later. The second image, shown below, is of more uncertain origin and identity. The suggestion had been that the man in the second photo was the same person as that shown in the first, photographed with his wife. 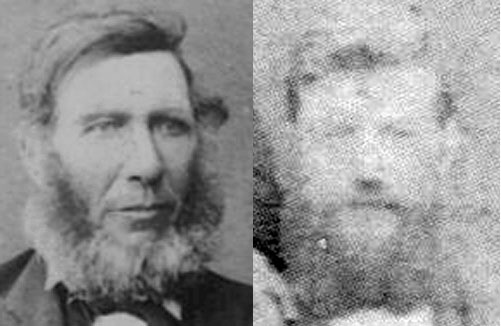 However, there was some disagreement in the family as to whether this was a correct identification of the couple in the second image. My correspondent merely wanted my opinion on whether the two photos could be of the same person. First, I looked at the age of the images. I believe that both photographs were probably originally taken in the 1870s. The lack of studio details and paucity of furniture, as well as the indistinctness of the woman's clothing, makes them difficult to date with any further accuracy. However, from the similarity of the poses and the mens' clothing, I believe that they could have been taken at around the same time. The face of the man in the second photo is unfortunately very faded. I've tried some digital editing and have attached a composite image showing the faces of both men. While they are both bearded and have roughly similar hair styles, I don't believe they are likely to be the same person. Note, in particular, the vertical distance between the bottom of the nose and the top of the upper lip. I would estimate the age of the first man as around 50 to 55. The second man appears to me to be somewhat younger - perhaps in his late 30s or early 40s - although I can't be sure of this, and he could be as young as late 20s or early 30s. Also it appears that their eyes and nose are a rather different shape. 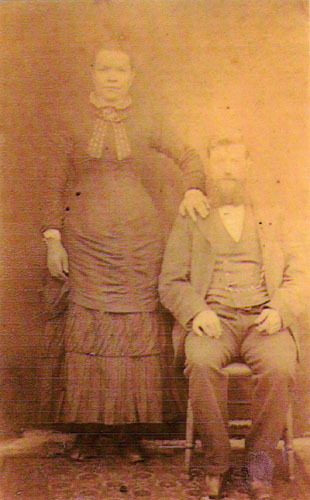 The woman's pose, with her hand resting on the seated man's shoulder, would have been carefully arranged by the photographer. She doesn't look entirely comfortable, but this was often the case with studio photographs of the era. However, the pose suggests - at least to me - that she was his wife. I would estimate that she is in her mid- to late 30s, possibly suggesting a similar age for her husband, If this is correct, then both are likely to have been born c. 1830-1845, and are unlikely to have arrived in Australia as a couple in their early 20s by ship in 1842. On the other hand the "older" man, photographed seated on his own, possibly in the early to mid-1870s, if he is as I suggest, aged 50-55, could have been born around 1820. This makes him a likely candidate for the immigrant who was about 23 when he arrived in Tasmania in March 1842 with his wife, and therefore born around 1818-1819. I decided to do a more quanititative examination of the facial characteristics on the men in the two photos. A simple comparison of the ratios shows clearly that, in relation to the distance between eyes and nose, the two mens' eyes are practically the same distance apart, but the man in the double portrait does indeed have a much narrower upper lip (ratio of 0.500 compared with 0.615). The figures bear out my visual analysis, and I feel even more confident that the two men in the photos are not the same person. John Palmer recently sent me the following advert from a newspaper covering the Wirksworth District. He found it within a pile of Wirksworth-related documents sent to him by Herbert Brooks, whose ancestors farmed Dale Farm near Wirksworth for four generations. 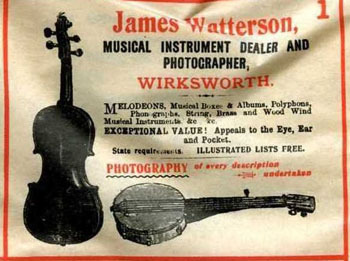 James Watterson took over the photographic business from his father shortly before this advertisement appeared in a newspaper in 1900. However, from this and an entry in a 1912 edition of Kelly's trade directory, it appears that his primary occupation was as a musical instrument dealer. Photographers themselves needed to advertise too. In the 1850s and 1860s, much of this was done through the local newspapers. 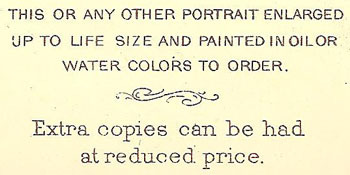 Some early photographers would also have flyers or handbills printed, to distribute in advance of a visit to a town. Since many of these early travelling or itinerant photographers did not include their names on the mount or case of the daguerreotype or ambrotype, the advertisements may sometimes be the only means we now have of knowing that a photographer operated in a particular area. This copy of one such early handbill was kindly sent to me by Mike Spencer, who found it in the holdings of the Derbyshire Record Office at Matlock (Ref. D267/96/2(i)). Either in Single Figure or Groups. Nothing can possibly equal the beauty of detail and faithful Likenesses of these portraits. from the plain bust to the highly finished whole length figure. Keeps constantly a variety of suitable Frames for the Daguerreotype Portraits and Paper Cuttings. Open from 9 in the Morning till 8 in the Evening. This advert is probably from the 1850s. 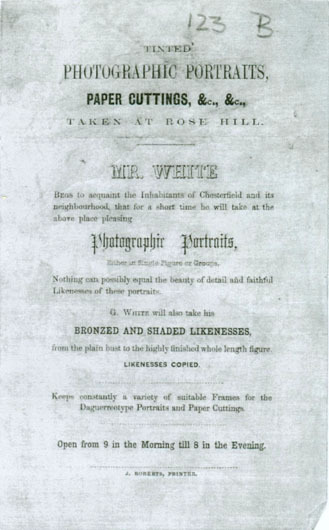 However, I've been unable to find any other record of Mr. G. White's photographic career. The 1851 and 1861 Census, and White's 1857 Trade Directory (transcribed and presented online by Neil Wilson), show nobody by this name in any profession, at least living in Chesterfield. I'd appreciate any information whch might shed light on his identity and time in Chesterfield. John Edward Roberts (1830-1908) was a Chesterfield postmaster, bookseller, printer & stationer with premises on the High Street. Cartes de visite were also used by other professionals to publicise of their work. This example, also sent to me by Nigel Aspdin, appears to have been used by an architect to promote his design for a new Post Office in Wakefield, Yorkshire. Nigel's great-grandfather Richard Wilkinson Aspdin "was appointed Postmaster of Wakefield in 1863 at which time he had been Postmaster of Derby for 10 years, Wakefield being his town of origin. 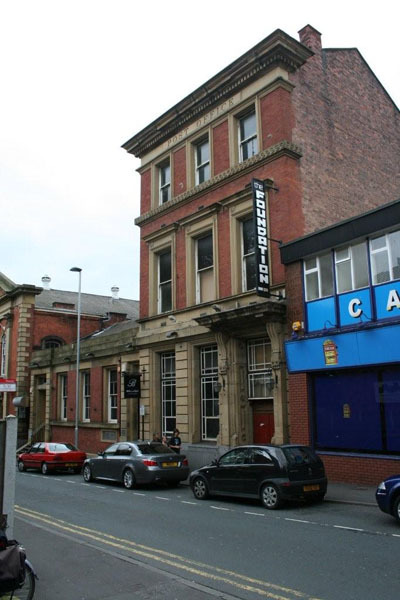 The building in Market Street was indeed built, in 1876, and was still there in February 2005, in use as a nightclub." The General Post Office, in Market street, is a handsome building of red brick, with stone dressings, opened August 1st, 1876. 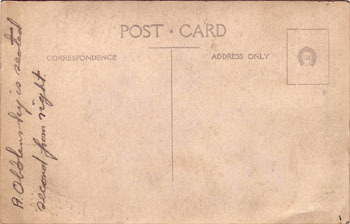 Post, Money Order & Telegraph Office, Savings Bank & Government Annuity & Insurance Office, Market street (next to the United Methodist Free Church). There were several architects in Wakefield in the 1870s, including William Crutchley (King street), Hammerton Lees (Lord Rodney yard, Westgate), Frederick Robinson (131 Northgate) and William Watson (Barstow square). 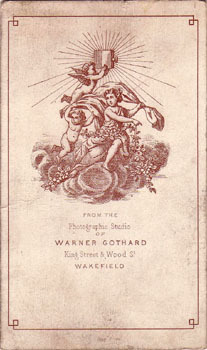 The photographer Warner Gothard advertised studio premises at "King Street & Wood St." Since the architect William Crutchley also had premises on King Street, it would be tempting to assume that he was the one to commission this cdv. However, Westgate, Northgate and Barstow square were all nearby, so it is more realistic to consider all four as potential architects of the Wakefield Post Office until further information is found. 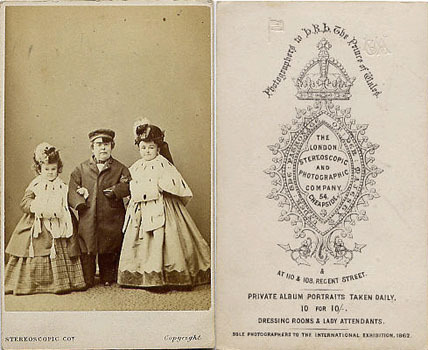 Carte de visites and, to a lesser extent, cabinet cards were also ocasionally used as a means of a more personal type of advertisement. My friend Tippie from Hampton, New Hampshire very kindly sent me this wonderful cabinet card which was in a small collection put together some years ago by her late father Louis DuBois, a keen amateur photographer. I find that, wherever I go, there is a certain class of men disposing of my photograph. Were the prices not so exorbitant and the picture a poor copy, I should not object. But since my friends are so imposed upon, I have had this picture taken, and will dispose of it for FIVE CENTS, or for less, or for nothing; and will continue to issue them as God gives me funds. I furnish these pictures to Rev. 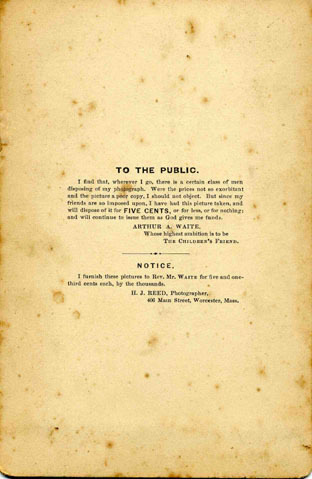 Mr. Waite for five and one-third cents each, by the thousands. 406 Main Street, Worcester, Mass. I couldn't really believe Arthur Waite's claim that other people were distributing photographs of him, let alone selling them, so I wondered whether this was a rather blatant form of solicitation for the purposes of preaching God's word, or perhaps a complete confidence trick. Was he really a "Reverend"? And what on earth was a "children's friend"? I spent some time doing background research on Waite, and discovered that he did leave paper trail. Arthur A. Waite was born around September 1849 in St Louis, Missouri, son of a portrait painter and Justice of the Peace, Liberty Waite and his second wife Mary Ann née McKeen. He married Hellen A. Flagg in that city in June 1868, and their first son Arthur C. was born in April the following spring. Between then and 1873, when a second son Henry was born, they moved to Tennessee, and then again to New York before December 1897, when a daughter Minnie was born. 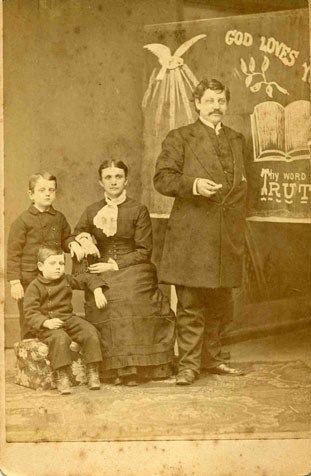 The 1880 Census shows Arthur living with wife and three children at 20 Independent, Newburyport, Essex County, Massachusetts, and described himself as a preacher. I've been unable to find them in the 1870 Census, and by 1900 Arthur had died, leaving his widow and elder son living at 871 Western Avenue, Lynn, Essex County, Massachusetts. Nor have I found any documentary evidence of his proselytizing. It appears that the two boys in the photograph were probably his sons Arthur and Henry. If so, then the photo was probably taken c. 1877-1878. The photographer H.J. 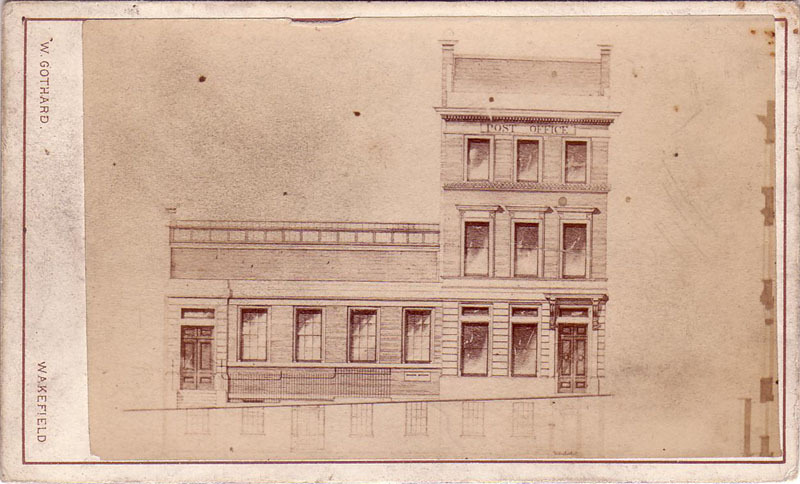 Reed operated from studios at various loations in Worcester, Massachusetts from the 1860s at least until around the turn of the century. Does anyone else have any ideas about this photo and how to find out more about the subjects? Nigel Aspdin sent me another example of a carte de visite published by The London Stereoscopic Company, but this one is not a photographic portrait. Instead it is a reproduction of a famous painting - the title reads, "Copy of the Stolen 'Duchess of Devonshire' by Gainsborough." Actually, it looks to me as if it is a photographic reproduction of an engraved copy of the painting, rather than a photograph of the painting itself. This celebrated picture was purchased by Messrs. AGNEW, at the sale of the late Mr. WYNN ELLIS'S pictures, for the enormous sum of £10,605. 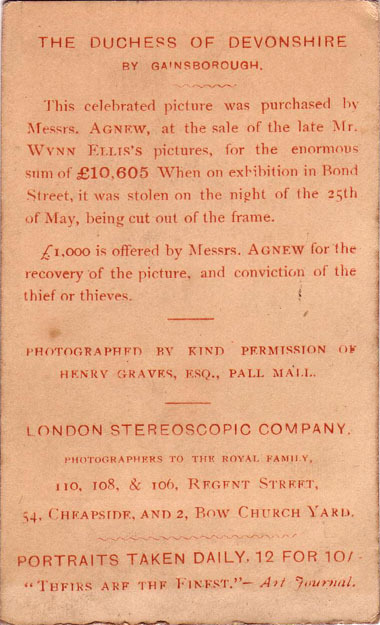 When on exhibition in Bond Street, it was stolen on the night of the 25th of May, being cut out of the frame. £1,000 is offered by Messrs. AGNES for the recovery of the picture, and conviction of the theif or thieves. 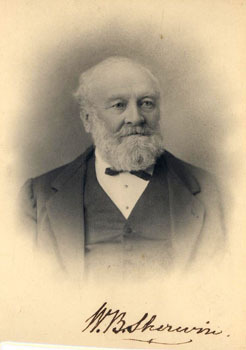 Photographed by kind permission of Henry Graves, Esq., Pall Mall. In 1878, burglar Adam Worth stole Gainsborough's The Duchess of Devonshire from London art dealers Agnew & Agnew, which he used to negotiate the release of an accomplice from prison. However, as Worth's friend had already been freed, he demanded a ransom instead, which would finally be negotiated for an undisclosed amount in 1901. 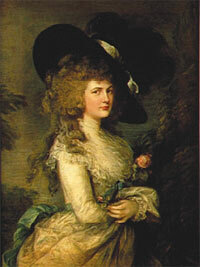 The portrait, which was eventually purchased in the 1990s by Andrew Cavendish, 11th Duke of Devonshire, for the Chatsworth collection, is partly reproduced in an article about the Duchess's life on Wikipedia. It was once said of the Duchess that, "a man could light his pipe by the fire in her eyes"! A more complete story of the fascinating history of the painting is given in a chapter of Joseph Geringer's book, Adam Worth: The World in His Pocket (The Crime Library). I've written in a previous post about how the carte de visite became wildly popular in the 1860s, mostly due to its low cost. Part of this popularity appears to have been due to the new fad for collecting pictures of famous people. Such cdvs are now enjoying a resurgence in popularity, and can fetch considerable prices on eBay. Reproduced below are two from my own collection. As a young man Robert Moffat (1795-1883) was sent by the London Missionary Society to Africa in 1816. He and his wife Mary settled at Kuruman, where they built a mission and remained there until 1870, when they returned to England. They had ten children, their oldest daughter Mary marrying famous African explorer, David Livingstone (1813-1873). 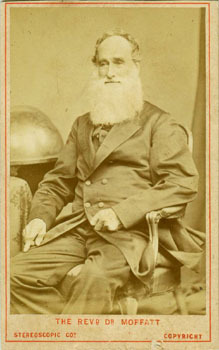 During his time in southern Africa, Moffat made several journeys into neighbouring regions such as Matabeleland (later in Rhodesia, now part of Zimbabwe), and published accounts of the trips both through the Royal Geographic Society and as a book, Missionary Labours and Scenes in South Africa (1842). His grandson Howard Unwin Moffat (1869-1951) subsequently served as prime minister of Southern Rhodesia from 1927 to 1933. According to Wikipedia, "His government passed the 1930 Land Apportionment Act, which defined the pattern of land allocation and ownership and is viewed as being one of the ultimate causes of the land disputes in Zimbabwe from 2000." To explain my interest in this particular cdv, one of Robert's descendants was a friend of mine while I was a school boy growing up in the Eastern Districts of Rhodesia. 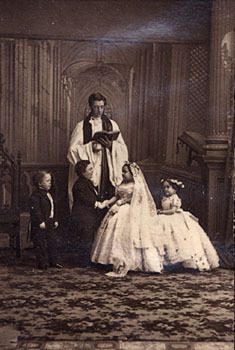 On February 10, 1863, "The Little Queen of Beauty" married international celebrity "General Tom Thumb" in a lavish ceremony at New York's fashionable Grace Church. The two performers enjoyed a true romance before announcing their engagement, which Tom Thumb's employer, P. T. Barnum , promoted to the hilt. For weeks before the wedding, crowds of 20,000 or more paid $3,000 a day to see the bride-to-be and her engagement ring. Barnum received 15,000 requests for tickets to the reception (which cost $75 each). On the wedding day, crowds blocked Broadway for hours, and newspapers published pages of detailed descriptions of the "Fairy Wedding," the gifts and the guests, who included New York's most fashionable families. 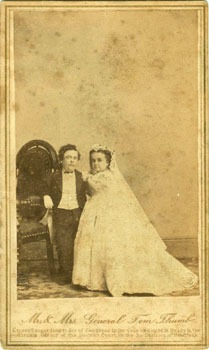 Barnum completed the wedding party with best man "Commodore" George Nutt and Minnie Bump, Lavinia's actual sister, and for years the group toured the globe, eventually reaching Japan, China, Australia, and India. 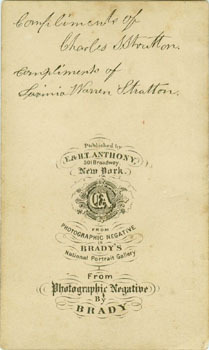 Brady made many carte-de-visite photographs in preparation for the wedding, an arrangement that doubtless profited everyone, including the performers, who sold portraits wherever they appeared. Another of Brady's portraits, including the bridal couple with the officiating minister and witnesses, "Commodore" G.W.M Nutt (another of Barnum's protegés) and Lavinia's sister Minnie Warren, is shown below. I was intrigued by the "signatures" of Charles and Lavinia Stratton on the reverse of the card mount, imagining the happy couple signing thousands upon thousands of them. However, a close examination and comparison with other examples found on the net show that they are not just similar, but identical, and must be printed facsimiles printed on the card. 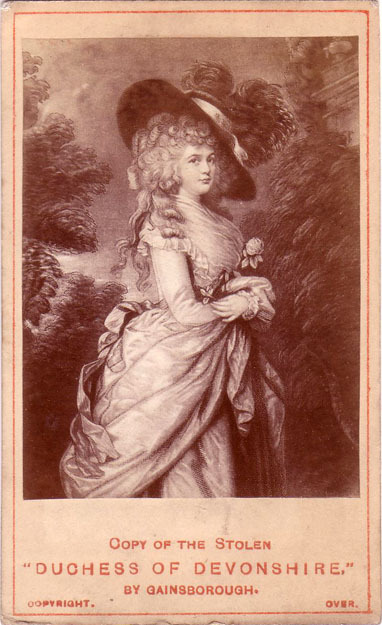 The carte de visite shown below, currently attracting bids of over £40 on eBay, picturing Minnie Warren and Charles and Lavinia Stratton, may have been taken in London on one of their visits to England, and published by the ubiquitous London Stereoscopic & Photographic Company (who also produced the Robert Moffat cdv above). Another feature of these portraits of famous people - at least on those from the US - is that they were often blind stamped with marks, symbols or monograms, possibly indicating that the photographs had been copyrighted. Two of these (a flag and the initials CAW, or perhaps GAW/GWA/WAG) can be seen on the reverse of the London Stereoscopic cdv of the Stratton-Warren family above. The cdv of the Strattons published by Anthony shows similar, but not identical, blind stamp marks on the front. If any reader can shed light on these marks, what they mean, and how to interpret them, I would be most grateful (email me). 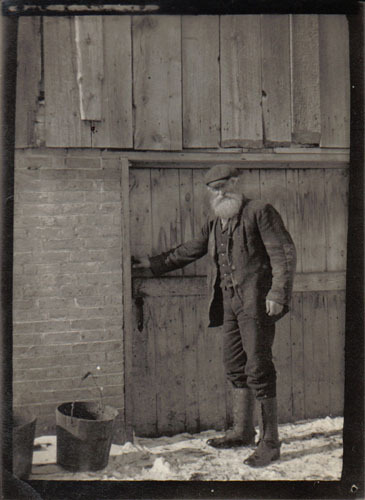 Another W.W. Winter image sent to me by Nigel Aspdin, this time of a member of his own family, typifies the photographic portraits employing large format card mounts which became very popular after the turn of the century (although they appear to have been first introduced in the late 1890s). In this particular example, the mount measures 201 x 246 mm (although it has probably been trimmed) and the photo itself 100 x 142 mm. Many of the portraits which include women are also characterised by enormous hats, a fashion accessory which became very popular at around this time. The photographic prints used were usually of a similar size to those produced for cabinet cards, but the card mounts were much larger. This resulted in a broad margin which was often embellished with printed, embossed or blind stamped decoration. Nigel's photo shows a young woman, perhaps in her twenties, with a lacy top and a wide brimmed hat (if indeed it can be called a hat - it looks more like a large bird's nest to me). Nigel believed the portrait to be of Maria Amelia Slater née Smith (1834-1913), daughter of John Smith, clockmaker of Derby, and wife of William Slater, stone merchant and lessee operator of Coxbench Quarry. I have a pair of small round framed portraits of a "couple", one certainly my great-grandfather William Slater, and the other is [a copy of] this particular portrait. I feel very confident that it is his wife ... 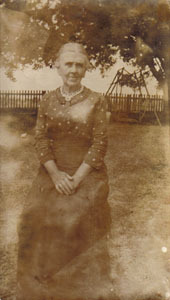 This mounted photograph is certainly printed and mounted after 1895 and possibly as late as 1913, if prepared for her daughters upon her death, from earlier material. If the subject is, say, 35 in the photograph, this would date the original photograph as about 1870... The small framed portraits were not taken at the same time [as each other] and they are framed in an amateur way, perhaps 1910-1930, but the fact that they are framed as a pair does, I feel, indicate "Mother and Father" ... The "Miss" Slater [written in pencil on the reverse of the mount] suggests to me that the print was done by one of the daughters, probably on the death of the subject in 1913. Two of the three daughters were still at home. Alice Elisabeth Slater, born 3 Jan 1879, died 22 or 23 Dec 1956, eldest daughter of William Slater of 19 Vernon St, Derby, stone merchant & lessee operator of Coxbench Quarry, and partner of W.H. & J. Slater Brick and Pipe Works, Denby (near Ripley), and builders, Walker & Slater, Derby. She married Percy Hassal(l) Mellor On October 30 1907. 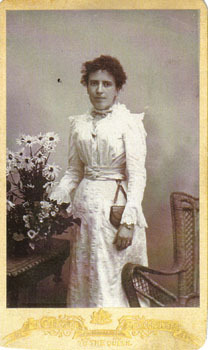 I think therefore that the date of the photo could well be 1907, she would have been 28, that looks realistic. Incidentally it has always been said that she was a suffragette and that when the census was taken she did not want to appear in it, so she slept the night in the office here at 19 Vernon street, the family home. (There was then no connecting door to the offices). She would have relied on my Great Grandfather to omit her when he completed the form that evening, and the family believed he did so. But when the 1901 census was published I was unsurprised to see that he did include her correctly ! Thanks for the image and the anecdote, Nigel. The photograph and story fit in perfectly with my mental image of Emily Pankhurst and the suffragettes. P.S. This image sent to me by Nigel shows a somewhat different Alice Mellor, in a rather intriguing portrait taken in June 1918 by W.H. Puddicombe of Bideford (Devon). Any ideas what the outfit and rake were supposed to mean? P.P.S. 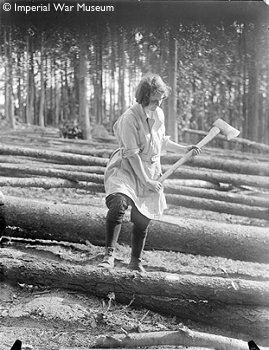 The web site of the Imperial War Museum has a feature entitled, "No job for a woman: The effects of war on womens' lives during the 20th and 21st centuries," which has a gallery of photographs of women doing various jobs normally done by men during the First World War. One of these is a woman in the Women's Forestry Corps, dressed in very similar clothes (see below) to those worn by Alice Mellor. 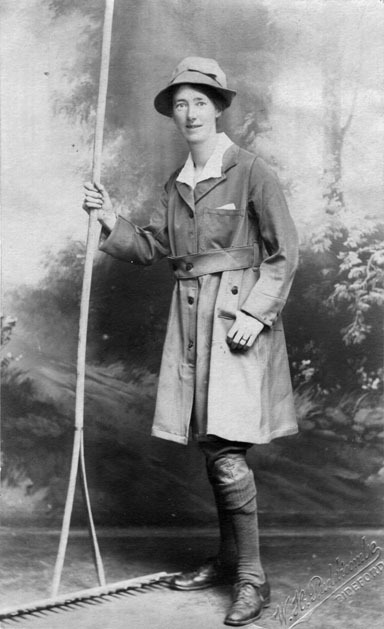 Bearing in mind that Alice's photo was taken in June 1918, it seems likely that she was occupied in some sort of agricultural work for the war effort. 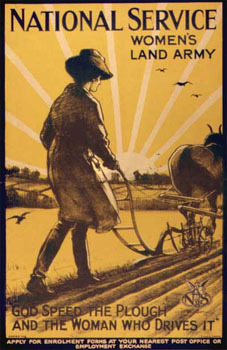 The creation of the Women's Land Army in 1917, was a response to the need to maintain agricultural production, when men working in that sector were being called up to the army to combat Germany's U-Boat campaign. I can also see her fitting right into this propaganda poster developed for recruitment purposes (from the Posters Collection on Michael Duffy's excellent First World War web site). In fact, the clothes are so similar - the hat, the short coat with broad belt, the sturdy shoes, the puttees up to just below the knees, all designed for working in the fields - I think it is probably a uniform! After sending me the image of the Ashe School Cricket XI, shown in the previous post, Nigel was browsing the W.W. Winter profile, and came across the image shown below, a large format portrait of a soldier identified on the reverse only as, "B.O. Corbett." Strange coincidence here! I decided to have a look at your WWW photos this evening. 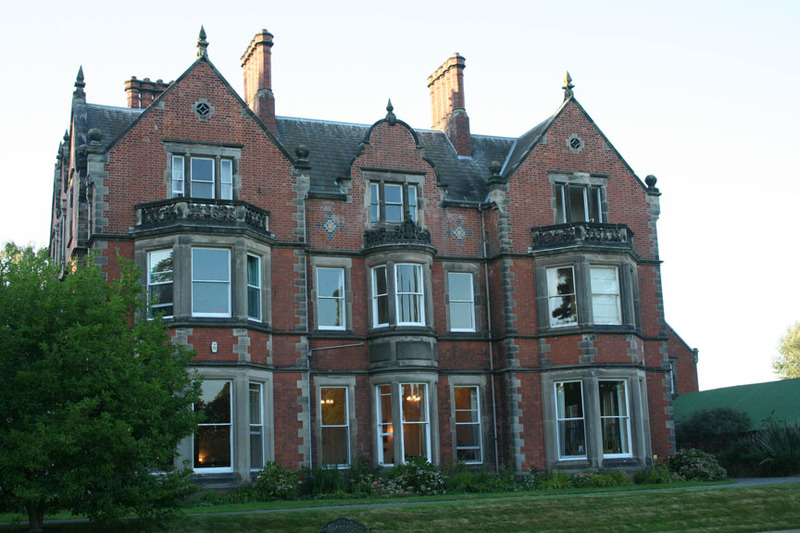 During my Obolensky investigations I contacted a man in his late 70s who had a connection with the local history society in Etwall, and he did tell me something about the Ashe school, as he had been at a rival school in nearby Mickleover. He told me that the school was run by... "the Corbett brothers". So when I went digging at the local studies library I looked for "Corbett", and all I found of interest was this short obituary in Derbyshire Countryside (Vol 33. No 2. Feb 1968, p23). Incidentally your photo is almost certainly a Grenadier Guards officer. I think you already know, as I told you in a different context, that traditionally the Grenadier Guards (see regimental badge) have recruited in Derby. Thank you, Nigel, for identifying this person, and for providing so much information about him. 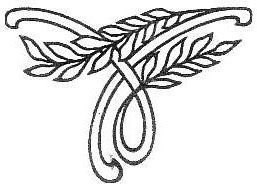 Bertie Oswald Corbett was born at Thame, Oxfordshire on 15 May 1875, son of the Vicar of Thame, Elijah Baggott Corbett (1837-1893) and his wife Mary Anne nee Davies. He was educated at Thame Grammar School before attending Oriel College, Oxford. He became a teacher, and was a schoolmaster at Brighton College before being appointed headmaster of a school in Dorset. B.O. Corbett and his brother C.J. Corbett both ran schools in Derbyshire. "Bertie" had a school at Shardlow Hall, while "John" was headmoster of Rycote on the Kedlestone Road, Derby, and later The Ashe at Etwall. 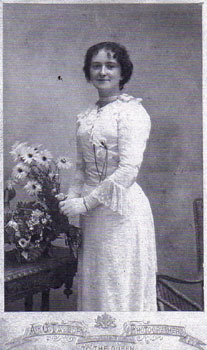 Bertie Corbett married Ella Stagg in Essex in 1912. He died at Waddon Manor, Portesham, Dorset on 30 November 1967. He got a blue for football at Oxford and played for the Corinthians Football Club (London) from 1897 to 1906, where he was known as an "extremely fast dribbler ... on the outside left," and in 1906 he published the "Annals" of that club. On March 18, 1901, he played his only full "A" international, which England won 6-0 due to four goals from famous Steve Bloomer. He was also a right-handed batting cricketer, making a single appearance for the Derbyshire county side against Kent. He only scored one run during the match, being stumped for a duck in the second innings. 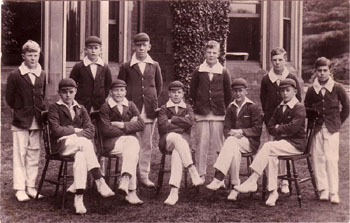 His older brother Leonard Bagott Corbett had attended Malvern College and All Souls, Oxford and beame a teacher, while his younger brother Cornelius John Corbett (1883-1944) was an even more accomplished cricketer, batting and fielding for Derbyshire on 27 occasions between 1911 and 1944. Nigel Aspdin found this photo postcard, apparently of a schoolboys' cricket team, blind stamped in the lower right hand corner with W.W. Winter's characteristic signature, amongst a collection of loose old photos of his late father and grandparents. 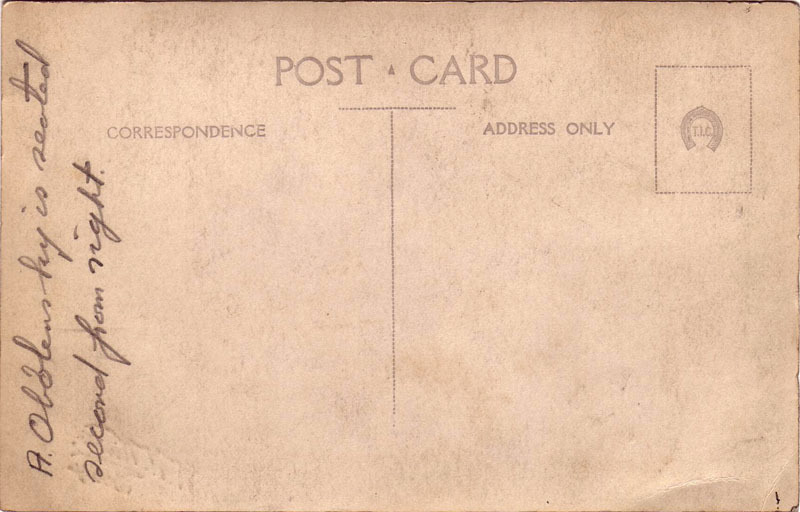 The postcard design (see reverse below) is similar to examples in my Winter studio profile and portfolio which I have estimated were taken in the 1920s. On the back, in my father's handwriting, was written "A Obolensky is seated second from right." This immediately prompted me to look at it more carefully, and a quick search came up with the Wikipedia entry. Prince Alexander Sergeevich "Obo" Obolensky (February 17, 1916 - 29 March 1940) was a Russian prince and an international rugby union footballer who played for England. He was popularly known as just "The Prince" by many sports fans. (Note that the Wiki entry for The Ashe and Brasenose College were added by me). What I really want to rub in, just in case you have adopted a recent affinity to the All Blacks, is his part in the first ever England defeat of the All Blacks, a feat you can view on YouTube. 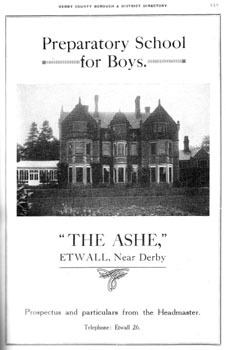 My father was at a private boys' preparatory school, The Ashe, at Ashe Hall near Etwall, Derby, and so this was the first easy clue, although I never remember him mention Obolensky. I took a trip out to the hall, now a Buddhist retreat, and sure enough the photo is taken on the path in front of the hall. In order to attribute Obolensky as a pupil (as opposed to a member of a visiting team...unlikely but just possible) I managed to extract a very poor blazer badge from the photo. It is this that has occupied me to date. Huge efforts at contacting people locally trying to track down former pupils have failed, as have efforts in local archives. 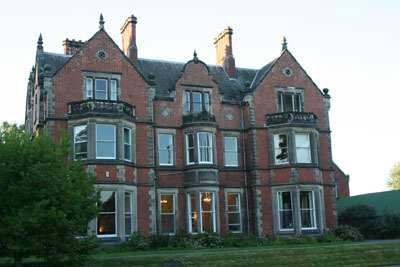 The school only existed between the wars, during both world wars the building was used by the military. I got a response from an Obolensky I found in USA, and from her information from another family member, and established that his college at Oxford was Brasenose. The archivist there gave me good information, but sadly only his secondary public school, Trent College, was recorded by them, an already published fact. Trent College archives have no information except of course his sporting achievements. I wonder if any readers might be able to identify either one of the boys in the photograph (Click here or on the image above for a more detailed version) or the badge on the blazer? Perhaps we can find someone who went to The Ashe School? Please get in touch with me if you can help. P.S. Nigel found the advertisement shown above in a 1935 edition of the "Derby County Borough & District Directory." It includes a facsimilie of the crest, which looks very similar to that shown on the boy's blazer.